Tajikistan became another state of post-Soviet Central Asia that on the governmental level decided to fight against journalists and strictly filter the public access to the World Wide Web. On October 11, 2010 the leading internet providers in Tajikistan blocked the access to the number of websites of local and foreign web media and Ferghana.Ru, Russian e-edition, specifically. Since the end of the last week the users of Vavilon internet provider in Tajikistan could not access Ferghana.Ru pages. Today, the access to the website was blocked by other Tajik internet providers – Telecom technology, Istera and Tajiktelecom. So far only the customers of Intercom can access our publications. The source in Telecom technology shared with Ferghana.Ru that the company is forced to perform the written order of Ministry of transport and communications of Tajikistan on blocking the number of websites, including Ferghana.Ru and Centrasia.Ru. The source mentioned that the companies never responded on such oral instructions before. Avesta, the local news agency, and Tjnews.com, the political comments blog, are also blocked. The visitors of the Todjnews agency are also facing difficulties in accessing this website. In response to limiting the public access to the information sources the local mass media criticized the government and shared the addresses of proxy services that help avoid the "filters", set by internet providers; this way, many Internet users may access filtered internet pages. It has to be mentioned this is not the first time when the Tajik government puts censorship on undesired websites. For instance, in 2006 prior to presidential elections in the republic, the Tajik Agency for regulation of communications (ARC), ordered to shut down the access to few websites, including Ferghana.Ru, motivating its decision by "the damage, caused to state policy". Meanwhile, in accordance with the legislation of Tajikistan, the government has no right to shut down the access to Internet resources without the appropriate decision of the court. Thus, the access to the website of Hizb ut-Tahrir, prohibited religious organization, was shut down in 2000 by the decision of the Supreme Court. Later on, the number of websites of the extremist organizations was filtered (also by the decision of the court). Speaking of Ferghana.Ru, Centrasia.Ru, Avesta and other currently filtered websites, since we have not seen the appropriate judicial decision we have reasons to believe that the actions of Ministry of transport and communications of Tajikistan and internet providing companies are illegal. In the opinion of local experts, the above-discussed decision of the government is reasoned by the coverage of the events in eastern Tajikistan. It is worth reminding at the moment, the governmental troops conduct special operation in the Rasht valley in order to eliminate the militants that attacked the military convoy of the Defense Ministry on September 19, which resulted in the death of 26 soldiers and officers. The journalists are not allowed to visit this region. The independent media in Tajikistan sharply criticized the Defense Ministry, blaming them in the lack of competence that became the reason of such a big death toll. Defense Minister Sherali Khairulloev demanded from law enforcement structures to investigate each critical publication and bring to trial those journalists and politicians that made such statements. In this opposition the journalists of Tajikistan counted to gain the support from President Emomali Rakhmon but in his last public speech the president mentioned that "as it was in the beginning of 1990s some Tajik mass media became militant again and pursue the only goal to publish sensational news". In the opinion of experts, the unbiased coverage of the events in the Rash valley is impossible today because there are no personal correspondents in that region while the Defense Ministry prefers to share little piece of information. In response, the government makes simple decision to block the internet media. On the other hand, such case is essential also for other republics in Central Asia, whose governments prefer to hide the problems rather than to facilitate the solution. Thus, after tragic events in Andijan (2005) the government of Uzbekistan blocked the access to few hundred websites, including Ferghana.Ru. Every once in a while the separate pages of Lenta.Ru¸Newsru.com, RIA Novosti also get blocked if they contain information, criticizing the Uzbek government. The links to alternative information are blocked in Turkmenistan. Kyrgyzstan restricted access to the number of websites few times. Kazakhstan was blocking LiveJournal and the number of opposition websites. 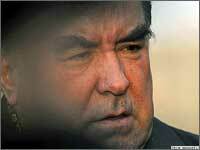 The current policy in Tajikistan is representative of Central Asian satrapy. Alas.